Immunoglobulin light and heavy chains contain variable and constant domains. The structural diversity of immunoglobulin antigen-binding sites arises from genetic recombination and somatic hypermutation of genes corresponding to the light and heavy chain variable region domains. Further diversity of κ and λ light chain constant domains arises from isotypic and allotypic variation. 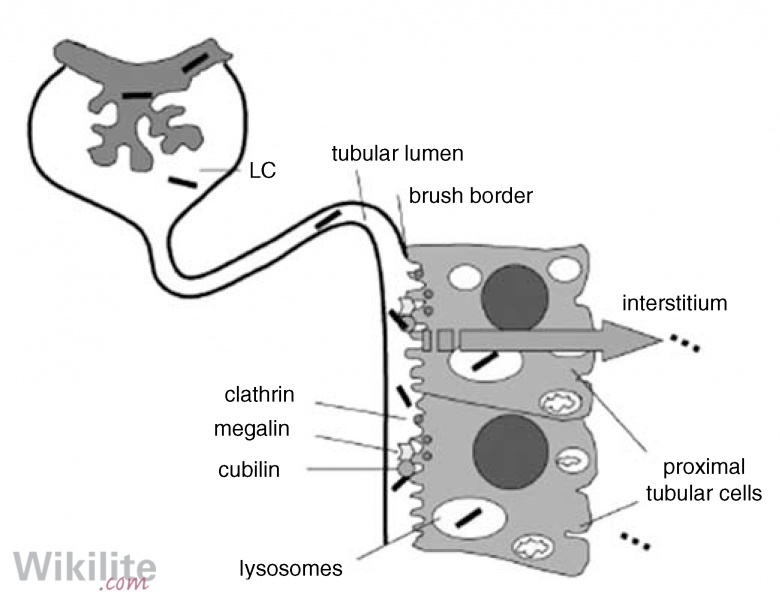 FLCs are secreted by plasma cells. sFLCs have a half-life of a few hours due to rapid renal clearance. Serum IgG has a prolonged and variable half-lie due to FcRn recycling. Figure 3.1. An immunoglobulin molecule showing light and heavy chain constant and variable region domains. VL: light chain variable domain; CL: light chain constant domain; VH: heavy chain variable domain; CH1 - CH3: heavy chain constant domains 1 - 3. Figure 3.2. A FLC molecule showing the constant region (left) and variable region (right). Each colour represents a β-pleated sheet. Figure 3.3. Different forms of secreted antibodies. Figure 3.4. Construction of a light chain. Antibody (immunoglobulin) molecules are composed of two identical heavy chains and two identical light chains. Heavy chains are each paired with a single light chain via a disulphide bridge and non-covalent interactions to form a heavy-light chain pair (or half-molecule). Two heavy-light chain pairs are linked by disulphide bonds in the so-called ‘hinge region’ to form a Y-shaped structure that is arranged symmetrically about a two-fold axis (Figure 3.1). Immunoglobulin heavy and light chains each have constant and variable regions. A pair of heavy and light chain variable regions together forms the antigen-binding site. 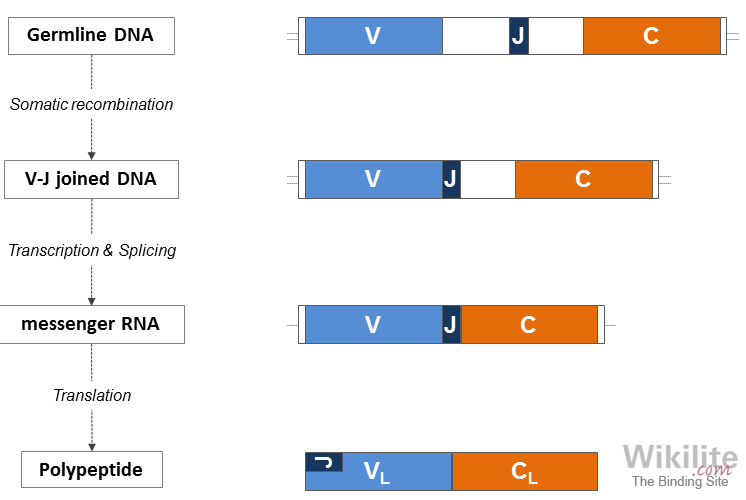 The variable regions exhibit enormous structural diversity, particularly of antigen-binding contacts, allowing the recognition of a huge variety of antigens. Antibody heavy and light chains are composed of homologous structural units known as 'immunoglobulin domains'. Each domain is approximately 110 amino acids long and is constructed from a series of antiparallel β-strands connected to form two β-pleated sheets. The sheets are covalently linked by an intrachain disulphide bridge and each domain adopts a roughly barrel-shaped structure characteristic of an immunoglobulin fold . The light chain tertiary structure consists of two immunoglobulin domains joined by a loop to form a single variable region and single constant region (Figure 3.2). In humans, light chains are encoded by two different gene loci, resulting in the serologically distinguishable light chain types, κ and λ. Immunoglobulin molecules are assembled in plasma cells with exclusively κ or λ light chain types, never both. Similar to light chains, the heavy chain contains one variable domain corresponding to a single variable region. 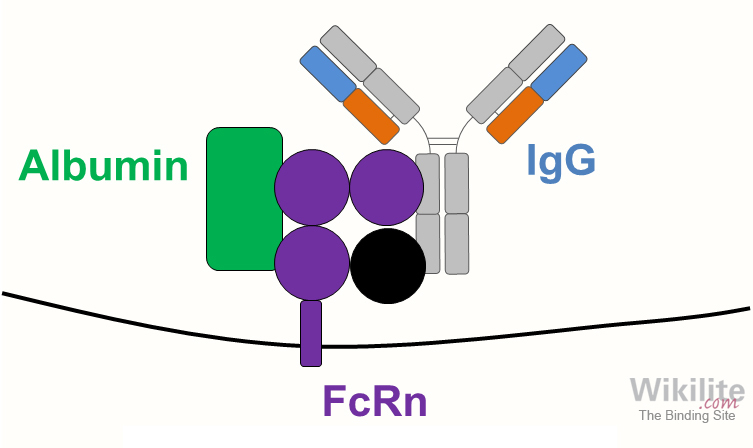 By contrast, the number of heavy chain constant domains (comprising the constant region) varies between immunoglobulin classes, of which there are five: IgG, IgA, IgM, IgD and IgE. Human IgG and IgA can be further divided into closely related subclasses IgG1, 2, 3 and 4, IgA1 and 2. These classes and subclasses are encoded by separate heavy chain constant genes (γ1-4, α1-2, μ, δ and ε, respectively). 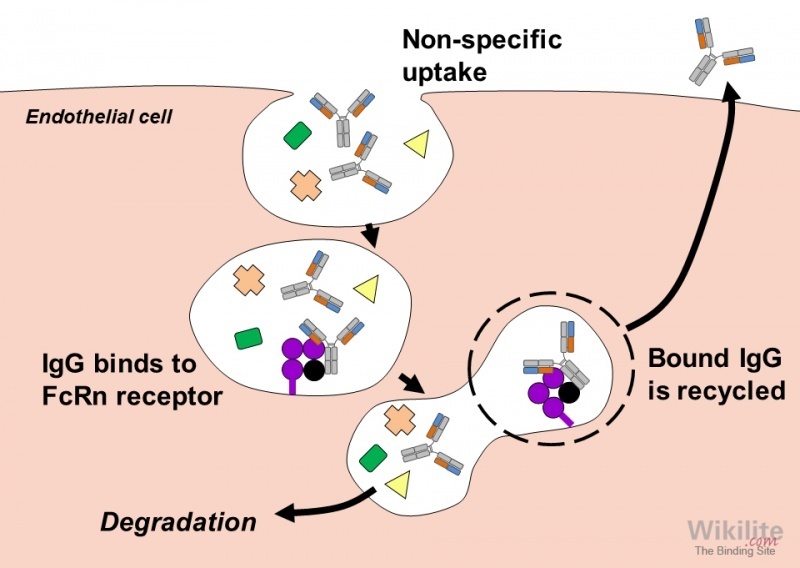 The constant regions of the heavy chain mediate most of the biological functions of antibodies by interacting with other effector molecules and immune cells. 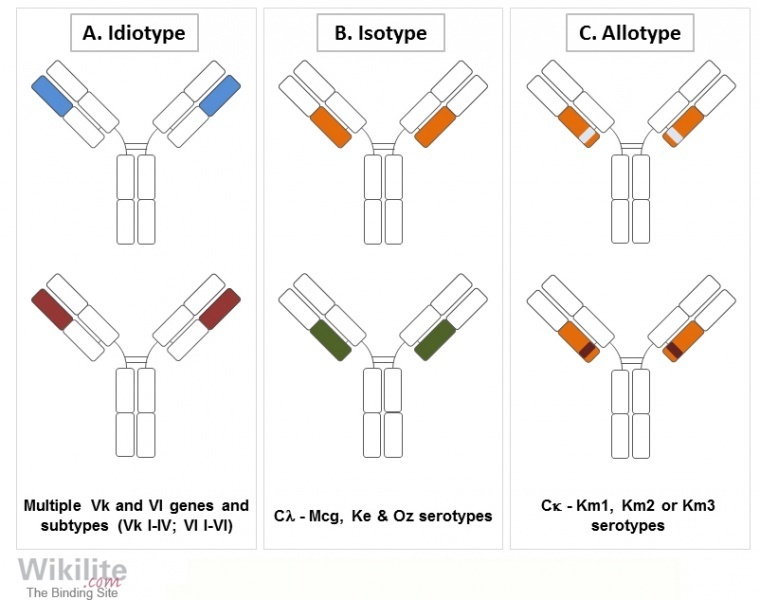 The majority of secreted antibodies are monomeric, although several immunoglobulin subtypes form oligomers, such as IgA and IgM (Figure 3.3). In B-cells, the heavy chains, κ light chains and λ light chains are each encoded by independent chromosomal loci containing multiple copies of analogous gene segments. The gene segments within each locus are rearranged stochastically by somatic recombination and RNA processing mechanisms, ultimately resulting in the expression of functional immunoglobulin proteins. 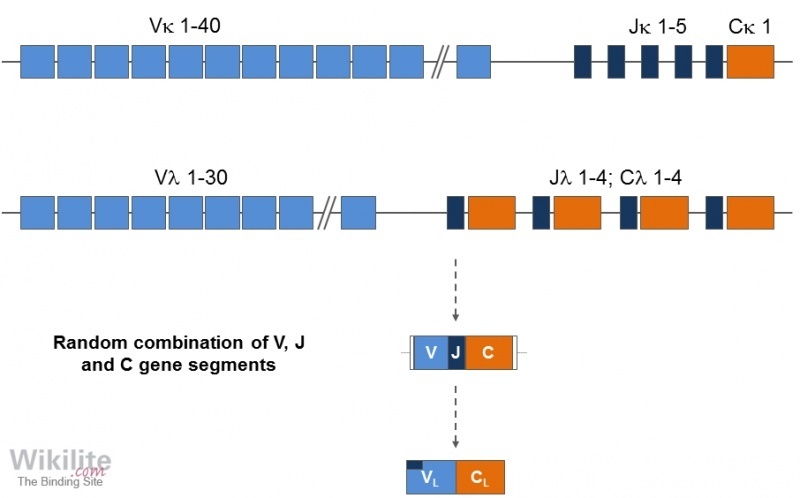 The light chain variable domain is constructed from variable (V) and joining (J) gene segments, whilst the constant domain is encoded by a separate constant (C) gene segment (Figure 3.4). The heavy chain variable domain is constructed from three gene segments: V, D (diversity) and J. In addition to genetic recombination and somatic hypermutation of the variable domains, further heterogeneity of light chains arises from isotypic and allotypic variation of the constant domains (Figure 3.6B and C). The human genome contains a variable number of λ constant genes, giving rise to multiple λ chain isotypes, which can be distinguished serologically by the expression of Mcg, Kern and Oz markers. Additionally, the genome contains a single κ constant gene for which three serologically-defined allotypes have been identified, designated Km1, Km2 and Km3 . These allotypes define three Km alleles, which differ in two amino acids, as presented in Table 3.1. There is no evidence that these constant region variants affect FLC measurements using Freelite® assays, which are based on polyclonal antisera (Chapter 5). Table 3.1. Amino acid substitutions in κ light chain constant domains. Figure 3.7. Diagrammatic representation of plasma cells producing intact immunoglobulins with monomeric κ and dimeric λ FLC molecules. Figure 3.8. Development of the B-cell lineage and associated diseases. Figure 3.9. Immunohistochemical staining of K-producing bone marrow plasma cells from a patient with MM using fluorescein-conjugated, anti-k antiserum. 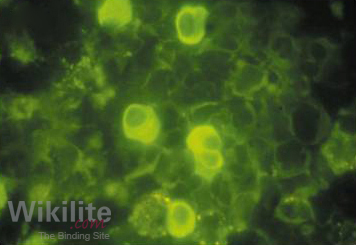 Five plasma cells can be seen. 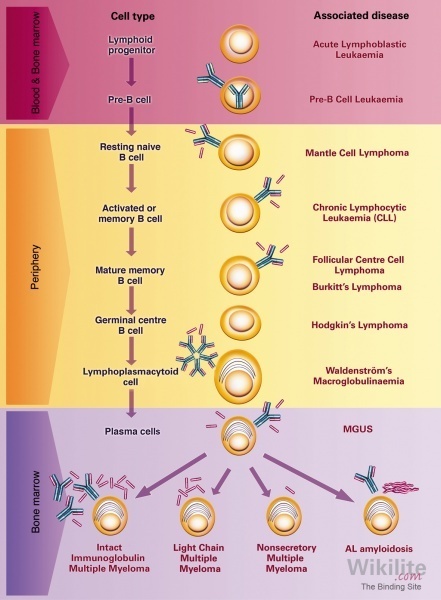 Immunoglobulins and FLCs are produced by B-cells. During their development the earliest immunoglobulin polypeptide to be produced is the μ heavy chain, in the pre-B-cell. Immature and mature B-cells produce either κ or λ light chains, which associate with μ heavy chains to form membrane-bound IgM. Upon activation, mature B-cells differentiate into plasma cells, which secrete immunoglobulin into the serum. Activation may also stimulate plasma cells to switch the heavy chain constant domain, and hence the class of antibody produced, for example, IgM to IgG. 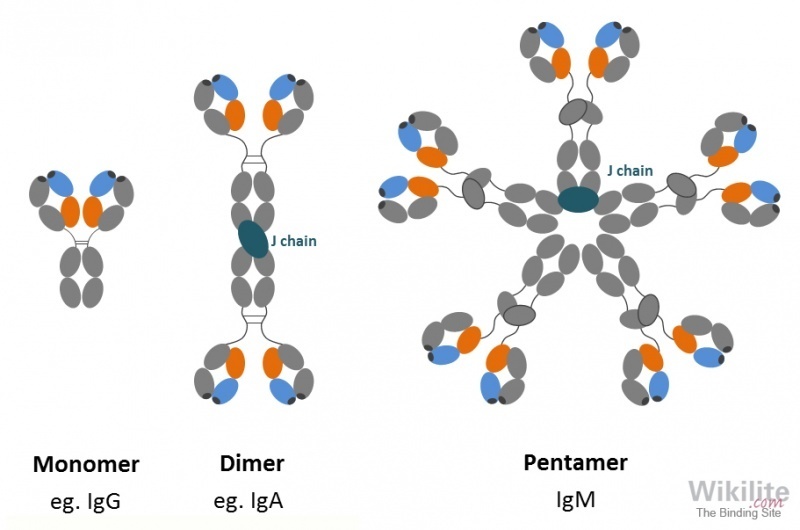 Approximately 40% more light chains than heavy chains are synthesised , and this excess of FLCs is thought to favour accurate assembly of intact immunoglobulin molecules. Light chains which remain unbound from their heavy chain partner are secreted into the blood as FLCs. Secretion of FLC is highest from plasma cells, with twice as many producing κ-chains than λ-chains. κ FLCs are normally monomeric, while λ FLCs tend to be dimeric, joined by disulphide bonds; however, higher polymeric forms of both FLCs may occur (Figure 3.7). Tumours associated with the different stages of B-cell maturation may secrete monoclonal FLCs and/or monoclonal intact immunoglobulins into the serum (Figure 3.8). In normal individuals, approximately 500 mg of FLCs are produced each day from bone marrow and lymph node cells . The molecules enter the blood and are rapidly partitioned between the intravascular and extravascular compartments. The normal plasma cell content of the bone marrow is about 1%, whereas in multiple myeloma (MM) this can rise to over 90%. In chronic infections and autoimmmune diseases the bone marrow may contain 5 - 10% plasma cells, and may be associated with hypergammaglobulinaemia and corresponding increases in polyclonal serum FLC (sFLC) concentrations. Identification of monoclonal plasma cells in the bone marrow by histology or flow cytometry is an essential part of MM diagnosis, and is frequently based on identifying intracellular κ and λ light chains by direct immunofluorescence techniques (Figure 3.9). Serum concentrations of FLCs and intact immunoglobulins reflect the balance between their production and clearance rates. An understanding of immunoglobulin clearance mechanisms in both normal and pathological conditions is important when considering the utility of sFLCs and intact immunoglobulins as tumour markers in monoclonal gammopathies. Figure 3.10. 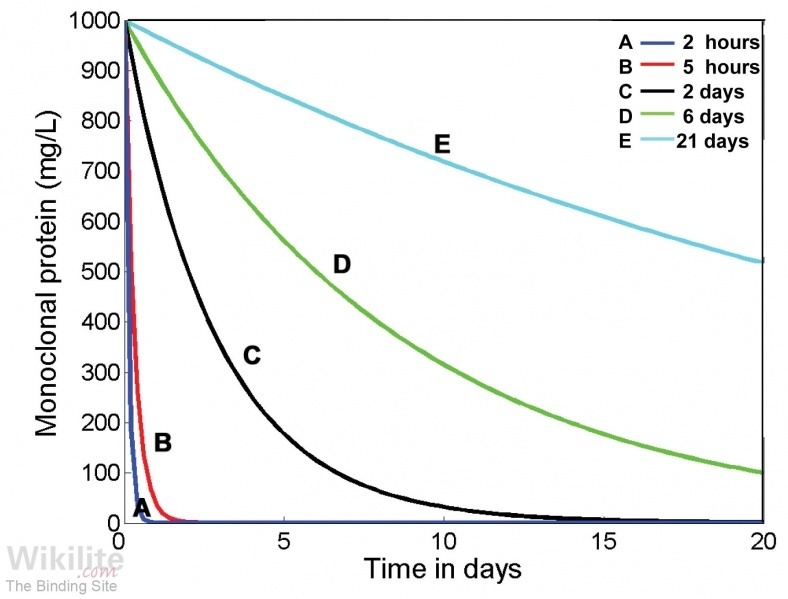 Calculated serum half-life curves for different immunoglobulin molecules. A) monomeric κ sFLCs; (B) dimeric λ sFLCs; (C) monomeric κ sFLCs with renal failure; (D) IgA and (E) IgG. (Courtesy of N. Evans and M. Chappell). sFLCs are rapidly cleared and metabolised by the kidneys. At around 25 kDa in size, monomeric FLCs, characteristically κ, are cleared in 2 - 4 hours at 40% of the glomerular filtration rate. 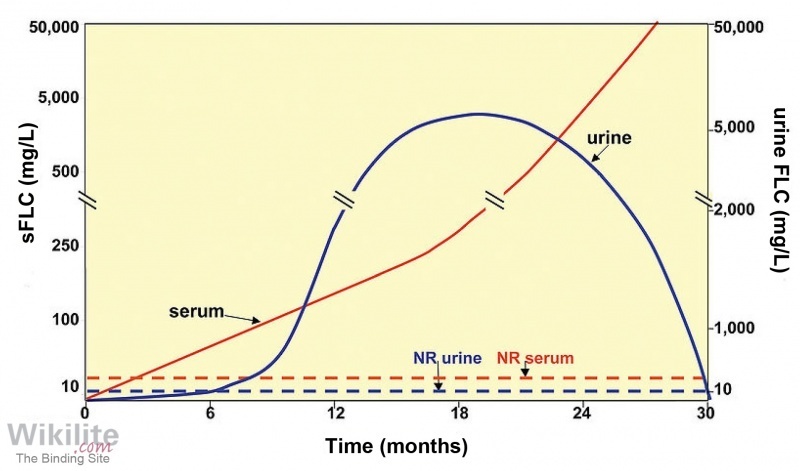 Dimeric FLCs of around 50 kDa, typically λ, are cleared in 3 - 6 hours at 20% of the glomerular filtration rate (Figure 3.10), while larger polymers are cleared more slowly . In contrast, IgG has a half-life of approximately 21 days with minimal renal clearance (Section 5.3). 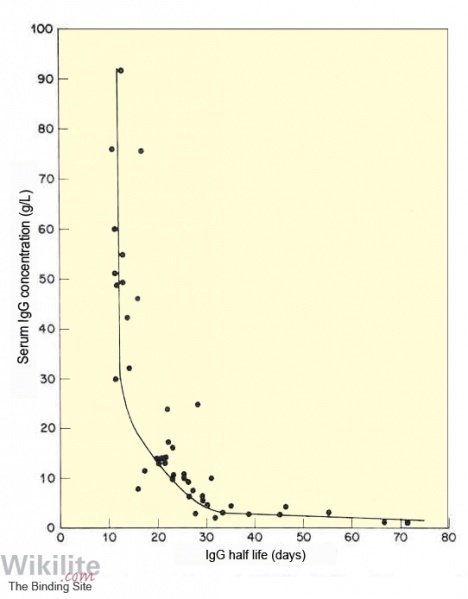 Although κ FLC production rates are estimated to be twice that of λ, their faster removal ensures that actual serum concentrations are approximately 50% lower (Chapter 5). The half-life of FLCs is dependent upon kidney function, so that FLC removal may be prolonged to 2 - 3 days in MM patients with complete renal failure . In patients with chronic kidney disease (CKD), κ and λ sFLC concentrations increase due to reduced renal clearance . When renal clearance is reduced, a greater proportion of sFLC are removed through pinocytosis by cells of the reticuloendothelial system . This mechanism removes κ and λ sFLC at the same rate so the relative FLC concentrations change to reflect more closely the higher rate of κ production and there are minor increases in the κ/λ sFLC ratio .